*"It is clear that without dealing a lethal blow to those powerful criminal networks that funnel money to terrorist groups, we cannot reasonably hope to completely obliterate the threat of terrorism and other organized criminal activity in our sub-region." African economies must treat money laundering and other financial crimes with zero tolerance to maintain and sustain economic, financial and political stability, according to VP Yemi Osinbajo. 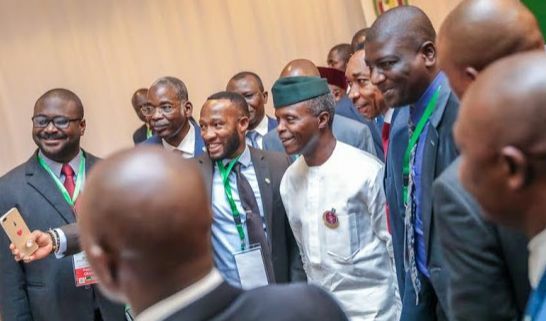 Prof. Osinbajo stated this at the opening ceremony of the Inter-Governmental Action Group against Money Laundering in West Africa (GIABA) 18th Ministerial Committee meeting, which held at the Sheraton Hotels and Towers, Abuja, Nigeria, on Saturday. “We have for long enough affirmed our commitment as a sub-region to fighting Money Laundering and Terrorist Financing. We must now back this intent with forceful action and visible results,” the Vice President said. Below is the full text of his speech at the event. It is my privilege and pleasure to welcome you all to Nigeria as you attend the 18th GIABA Ministerial Committee meeting today. Let me start by commending the Inter-Governmental Action Group against Money Laundering in West Africa (GIABA) for the support to member States in implementing robust Anti-Money laundering and terrorist financing measures in line with acceptable international standards, particularly the Financial Action Task Force (FATF) recommendations. GIABA has worked hard in keeping with the ECOWAS mandate to eradicate Money Laundering and Terrorist Financing from our region by regularly assessing and evaluating member states on their implementation of the FATF standard recommendations. Since the beginning of this week, all member states of the GIABA (the 15 ECOWAS countries, and Sao Tome & Principe) have gathered here in Abuja under the auspices of GIABA to evaluate their respective AML/CFT regimes and share experiences on the way forward in tackling these financial crimes. Let me also commend the dedication of the GIABA Ministerial Committee, which stands at the helm of GIABA, serving as the conduit of political will and funding from the member-states, as well as providing it with policy directions required to conduct its activities. Your Excellencies, Honourable Ministers, Money Laundering and Terrorist Financing are crimes that have significant ramifications for the security and wellbeing of our various countries. In Boko Haram we have seen the devastation that a well-resourced terrorist group can wreak, not just on individual lives and livelihoods, but also on the stability of national and regional political and economic systems. In the last decade, more than 20,000 lives have been lost to terrorism propagated by Boko Haram, and more than 2 million persons displaced. One important question that arises is this: How did a once-obscure sect, domiciled primarily in a single city in Northern Nigeria, evolve to become, at one point, a menace, not only to the country but to the entire Lake Chad Basin? I’m certain that a significant part of the answer to those questions will be found in the complicated multinational networks of financing that sustained the group and nurtured its hateful vision. There is absolutely no way that Boko Haram would have grown as dangerous as it did without access to funding and resources, mobilized from far and wide. It is clear that without dealing a lethal blow to those powerful criminal networks that funnel money to terrorist groups, we cannot reasonably hope to completely obliterate the threat of terrorism and other organized criminal activity in our sub-region. Boko Haram is just one example of how much evil can be done by a subversive group that has figured out how to raise money in the shadows. There are many others like it, with similar or different goals, all of them united by the need to raise financing to achieve their aims. We know that the lines between terrorist groups, corrupt politicians, traffickers (whether of drugs, guns or people); fraudsters; smugglers; kidnappers; illegal oil bunkerers, etc, have always been blurry; that these groups have always found complementary need for one another’s tactics and strategies. Indeed, if there’s one thing that the world’s deadliest terrorist groups, from Al Qaeda to ISIS to Al-Shabaab, have in common, it is the ease and expertise with which they diversify their criminal activity while retaining their overarching goal of inflicting maximum devastation. Today, in the age of the Internet, that blurring has intensified. Cyberspace has made it easier than ever for criminal syndicates to not only draw inspiration and learning from one another, but to also devise increasingly complex means of fundraising and of bypassing conventional financial system checkpoints and safeguards. The advent of Bitcoin and other cryptocurrencies provides the unprecedented levels of discreetness preferred by criminal networks. The result is that financial crime is able to always stay a few steps ahead of governments and the law. As for official corruption, all around us we see its devastating effects – in the rundown schools and hospitals; potholed roads; under-equipped armies; subverted financial systems, and fragile democracies. At risk from money laundering especially the laundering of proceeds of corruption, and terrorist financing are the stability of our financial and political systems, and ultimately the development of our countries and the prosperity of our people. What this means is that we are dealing here with an existential threat – it’s either we wipe it out or it wipes us out. This should spur us to treat money laundering and other financial crimes with zero tolerance. We have for long enough affirmed our commitment as a sub-region to fighting Money Laundering and Terrorist Financing. We must now back this intent with forceful action and visible results. While we acknowledge the steps we have taken, individually and collectively, in recent years – implementing recommendations, strengthening institutions, building partnerships and collaborations – we cannot afford complacency at this time. This is actually the reason why we need to redouble our efforts, to shore up the political will required to apply and implement the laws and frameworks we have worked hard to develop. Information sharing is very important to the success of our fight. This means that on the one hand we should rise above the temptations of secretiveness and mutual suspicion; and on the other hand we must do everything in our power to sustain trust and confidence by safeguarding every piece of information that is being shared across national databases. We must also strive to work beyond the barriers imposed by the differences in our various legal systems, bearing in our minds that the criminals we are tackling have never allowed themselves to be held back by these obstacles. I trust that these issues and more will be exhaustively covered in your deliberations at this meeting. Permit me to raise a matter of considerable importance to many of our nations. It is the difficulty we experience in repatriating proceeds of corruption from financial institutions of the more developed nations. Despite numerous mutual legal assistance treaties and Conventions, it is obvious that we are not making the sort of progress we expect to see. It is unconscionable, in our view, to have stolen funds in a bank within the jurisdiction of an FATF country and to have to go through a rigorous obstacle course to retrieve the funds and even when such funds are to be returned after several years, humiliating conditions are attached. It is the view of Nigeria that FATF countries must, as a matter of respect for the spirit of our collaboration, and with the same efficiency and zero tolerance for quibbling, ensure the smooth repatriation of proceeds of corruption to the economies from where they were stolen. The other issue is the risk of the dangers posed by anonymous corporate ownership. If nothing else, the Panama Papers and now the Paradise papers clearly illustrate the global scale and spread of this problem. So this is a global challenge and nothing less than a truly global approach will be needed to tackle it. We must commend the United Kingdom, Norway, Netherlands and Denmark for leading the way in establishing public registers of the real, human owners of companies in their countries. We call on other G8 and G20 countries not only to follow suit but also to initiate actions to end corporate secrecy in some of their dependencies. We cannot have anonymous ownership of companies, trusts and other arrangements designed to cover ownership of assets, and at the same time expect optimal results from anti-money laundering measures. Once again, I thank GIABA and the GIABA Ministerial Committee for choosing to host this meeting in Abuja, Nigeria. I wish you fruitful deliberations as you go into your closed session.